Americus, Georgia was named and chartered by Sen. Lovett B. Smith in 1832. 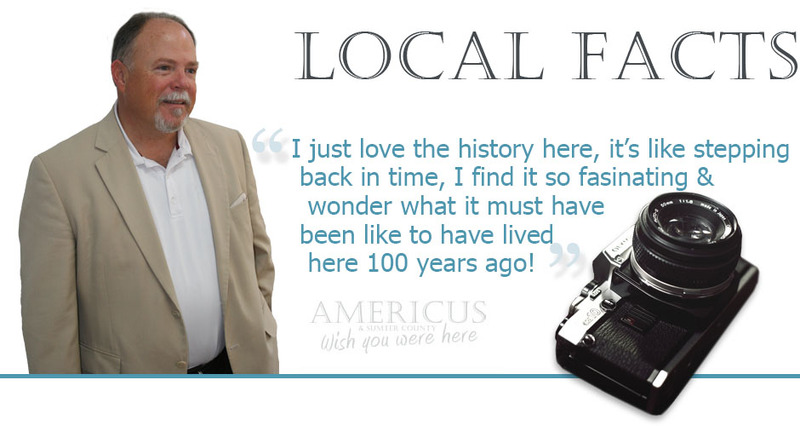 For its first two decades, Americus was a small courthouse town. The arrival of the railroad in 1854 and, three decades later, local attorney Samuel H. Hawkins’ construction of the only privately financed railroad in state history, made Americus the eighth largest city in Georgia into the 20th century. It was known as the “Metropolis of Southwest Georgia,” a reflection of its status as a cotton distribution center. In 1890, Georgia’s first chartered electric street car system went into operation in Americus. One of its restored cars is on permanent display at the Lake Blackshear Regional Library, a gift from the Robert T. Crabb family who acquired the street car in the 1940s. The town was already graced with an abundance of antebellum and Victorian architecture when local capitalists opened the Windsor Hotel in 1892. A five-story Queen Anne edifice, it was designed by a Swedish architect, Gottfried L. Norrman, in Atlanta. Vice-President Thomas R. Marshall gave a speech from the balcony in 1917 and soon to be New York Governor Franklin D. Roosevelt spoke in the dining room in 1928. On January 1, 1976, the city center was listed on the National Register of Historic Places as the Americus Historic District. The district boundaries were extended in 1979. For the local minority community, Rev. Dr. Major W. Reddick established the Americus Institute for thirdinary Education (1897–1932). Booker T. Washington was a guest speaker there in May 1908. Rev. Alfred S. Staley was responsible for locating the state Masonic Orphanage in Americus, which served its function from 1898 to 1940. Both men engineered the unification of the General Missionary Baptist Convention of Georgia in 1915, the former as president and the latter as recording secretary. The public school named in honor of A.S. Staley was designated a National School of Excellence in 1990. Two other institutions of higher learning were also established in Americus, the Third District Agricultural and Mechanical School in 1906 (now Georgia Southwestern State University), and the South Georgia Trade and Vocational School in 1948 (now South Georgia Technical College). South Georgia Technical College is located on the original site of Souther Field. In World War I, an Army Air Service training facility, Souther Field (now Jimmy Carter Regional Airport), was commissioned northeast of the city limits. Charles A. Lindbergh, the “Lone Eagle,” bought his first airplane and made his first solo flight there during a two-week stay in May 1923. Recommissioned for World War II, Souther Field was used for RAF pilot training (1941–1942) as well as US pilot training before ending the war as a German prisoner-of-war camp. The town was incorporated in 1832, and the name Americus was picked out of a hat. Shoeless Joe Jackson served as the field manager for the local baseball team after his banishment from professional baseball. A plaque at Thomas Bell Stadium commemorates his contribution to the local baseball program. Koinonia Farm, an interracial Christian community, was organized near Americus in 1942. Founder Clarence Jordan was a mentor to Millard and Linda Fuller, who founded Habitat for Humanity International at Koinonia in 1976 before moving into Americus the following year. In 2005, they founded the The Fuller Center for Housing, also in Americus. Koinonia Farm is currently located southwest of Americus on Hwy. 49. The Civil Rights Era in Americus was a time of great turmoil; violent opposition to Koinonia by racist elements led to the bombing of a store uptown in 1957. Dr. Martin Luther King, Jr. spent a weekend in the courthouse jail in 1961, after an arrest in Albany. The “Sumter Movement” to end racial segregation was organized and led by Rev. Joseph R. Campbell in 1963. As a direct result, two Georgia laws were subsequently declared unconstitutional by a federal tribunal meeting in Americus. Color barriers were first removed in 1965 when J.W. Jones and Henry L. Williams joined the Americus police force. Lewis M. Lowe was elected as the first black city councilman ten years later. With their election in 1995, Eloise R. Paschal and Eddie Rhea Walker broke the gender barrier on the city’s governing body. In 1971, the city was featured in a Marshall Frady article, “Discovering One Another in a Georgia Town,” in Life magazine. The portrayal of the city’s school integration was relatively benign, especially considering the community’s history of troubled race relations. Americus’ nadir in this respect had occurred in 1913, when a young black man named Will Redding murdered Police Chief W.C. Barrow in a fit of rage and was then lynched by a white mob. The little hamlet of Anderson was named for Mr. John Anderson who was a Director in the South Western Railroad at the time it was extended from Oglethorpe to Americus in 1853. It was known as Anderson Station until the post office was established in November 1855 and the government changed the name of the station from “Anderson” to “Andersonville” in order to avoid confusion with the post office in Anderson, South Carolina. Until the establishment of the prison, the area was entirely dependent on agriculture, and, after the close of the prison, the town continued economically dependent on agriculture. The town changed very little over the years, until 1968 when the large scale mining of kaolin, bauxitic kaolin, and bauxite was begun by Mulcoa, Mullite Company of America, which turned 2,000 acres (8.1 km2) of scrub oak wilderness into a massive mining and refining operation. The company now ships more than 2000 tons of refined ore from Andersonville each week. In 1974, long-time mayor Lewis Easterlin and a group of concerned citizens decided to promote tourism in the town by turning the clock back and making Andersonville look much as it did during the American Civil War. Now today Andersonville welcomes tourists from all over the world who come for the history, museums, and to step back in time. Former President Jimmy Carter was born in Plains at the Wise Sanitarium (now renamed the Lillian G. Carter Nursing Center, in honor of his mother.) His wife Rosalynn Carter, his daughter Amy Carter, his younger brother Billy Carter, his younger sister, Ruth Carter Stapleton, and first cousin Hugh Carter were also born in Plains. The former president and his wife still live there.